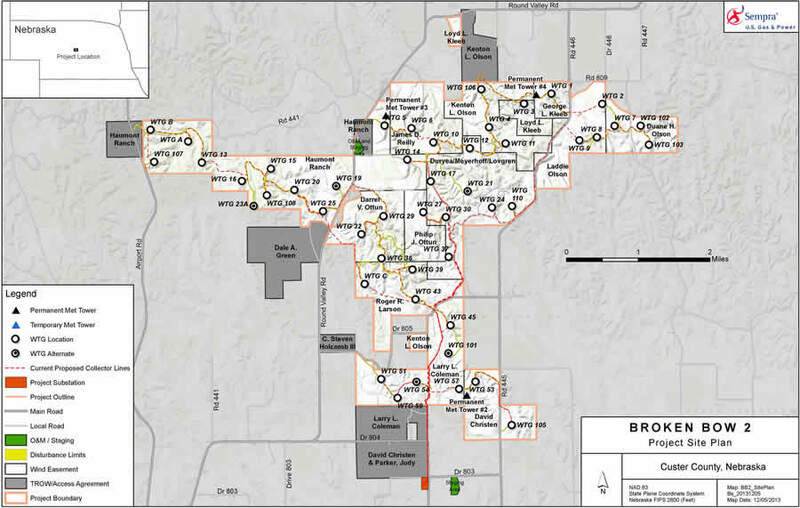 Static maps show the Broken Bow II project, a wind farm in Nebraska. But they may be limited in the ability to show the level of detail needed to answer a specific question. Online maps are changing the way Sempra Global managers communicate internally, helping them make faster and smarter business decisions. Sempra Global is a holding company for Sempra Energy, which generates, transmits, and distributes energy for more than 31 million customers worldwide. Sempra Global manages diverse assets such as pipelines, wind turbines, liquefied natural gas terminals, and hydroelectric generating facilities. Maps are an important resource at Sempra Global, which maintains data on its assets and projects using Esri ArcGIS. Maps created in PDF or JEPG format by the company’s GIS team have long been used to share that data with Sempra engineers, managers, senior vice presidents, and directors, especially in presentations and meetings. Static maps, however, didn’t always show the extent or detail needed to answer specific questions that came up in meetings. Getting the answer might require returning to the GIS team and requesting a new map. Griffin wanted to bring the maps to life so that everyone, whether they were trained in GIS or had never heard of it, could access and analyze the maps in real time. 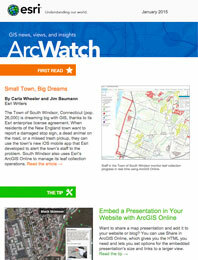 So he convinced the company’s IT department to get his team an ArcGIS Online subscription. 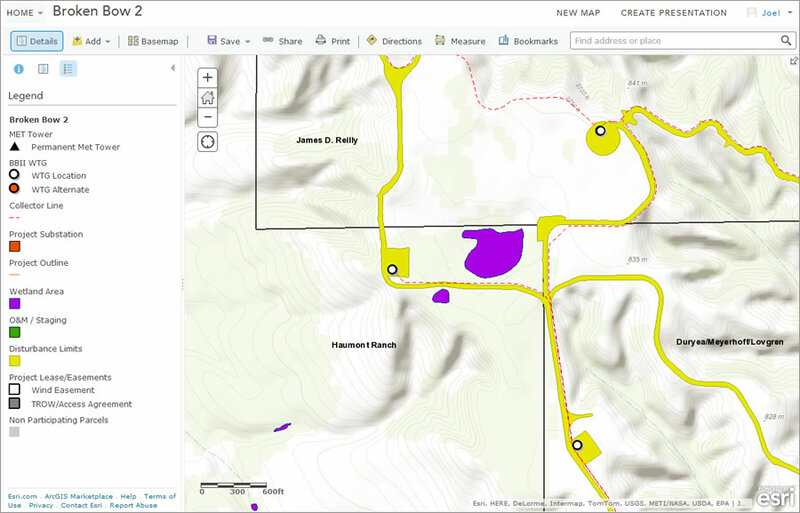 The subscription was part of an enterprise license agreement (ELA) with Esri. With it, Griffin’s team could create real-time, interactive web-based maps to supplement the static maps Sempra had been using. Now if the managers in a meeting want to get a closer look at a transmission pipeline or find more information about it, they click and zoom in on a web map. There’s no need to request another map. Reducing the number of map requests freed up time for Griffin and his team to improve the quality of Sempra’s data. This quickened and strengthened business decisions. Sempra Global employees can zoom in and query this online map of the wind farm to find answers to questions quickly. Sempra Global capitalized on the additional benefits that come with an ELA. Access to maps and data could be controlled. Users were authorized to access only those maps and data that were related to their projects, improving security. The GIS team eliminated redundancy in data files by consolidating data that previously existed in various folders, servers, and hard drives. From these, the team built a single source that can be centrally maintained, eliminating multiple and possibly conflicting versions of the same dataset. With online maps, more people can access the data. More than 50 Sempra Global employees directly use the web maps. Engineers, developers, project managers, and executive staff can log in and access what they need without requesting that data from anyone. With information instantly accessible, employees can move faster. Sarah Alban is an Esri Writer.